What a ride it has been for the Philadelphia Eagles this season, from a great start on the first Monday night of the year, where they took down divisional rival Washington Redskins. There were wins over the Raiders, Lions, Bears and Giants by a combined 101 points. But then there are the losses to the Vikings, Giants and Cowboys against whom they scored only 3 points. They started the year with Michael Vick at quarterback, but when he fell to injury, Nick Foles emerged and became one of the top stories in the NFL this year. He would finish the season leading the NFL in quarterback rating. He was a 2 time offense player of the week. He had a 7 touchdown game against the Raiders, and an incredible 27-2 TD to INT ratio – also an NFL record. Not bad for a guy who was a back-up at the start of the year. In fact, Foles chance only came when Vick got hurt. As you can read in this article, though, when Vick was injured, Foles, remained a team player. 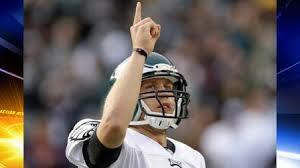 The injury allowed for Foles to get a chance, but he was also praying for Vick’s recovery. Not only that, but when Packers QB Aaron Rodgers got injured the week before the Eagles were to play Green Bay, Foles mentioned in an interview that he would be praying for Rodgers recovery as well. 2- Praying for the enemy – Also intriguing is the story that surfaced that Foles was praying for Aaron Rodgers when he was injured, too. Again, typically, as we consider our favorite sports teams and the teams our favorites play against, we like to have the easiest route, the best chance to win. But Foles, when asked about Rodgers and the injury that knocked him out of play the week before the Eagles played the Packers, planned to pray for Rodgers. Again, what a reminder that life is more than the results of a game or even a season. The showing support and concern for another, even if it is someone that the world tells us we should dislike, is a great way for God’s love to show through and help define our character. In this small action, Foles shows that the game is not more important than the well being of others and praying for each other is what we are called to do. 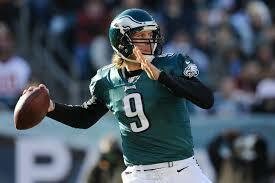 3- Stay Humble and Give God the Glory – Foles and the Eagles had some great moments this season. 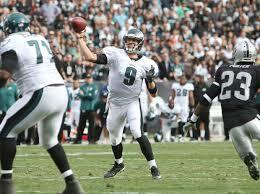 High completion rates, 7 touchdowns in a game and great success as a starter have thrust Foles into the spotlight. But what a great philosophy to have. God is at work and we are to reflect Him and give credit to Him in all things. When things are going well, what a great chance to remind ourselves that we can’t do these things alone, and it is only God who deserves credit for anything that happens in our lives.